Breeds of small dogs come in all shapes and sizes. Some are couch potatoes and others prefer to run a marathon. Some like to work and others think their only job is to keep your lap warm. Fuzzy hair, smooth hair, wiry, silky--if you have a preference, you're in luck: Small Dogs have an amazing array of lovely coat types, and some that don't have coats at all! If size is what matters, you have a wide selection of pups to choose from, all 25 pounds or less. The American Kennel Club (AKC) recognizes over 180 different breeds in nine groups. Small breed dogs are represented in all those groups except the Working Group. As of this writing, the United Kennel Club (UKC) lists over 300 breeds. The Kennel Club (KC) recognizes 210 breeds and the Canadian Kennel Club (KC) has 175 breeds. The Federation Cynologique Internationale (FCI) or World Canine Organization, based in Belgium lists 322 breeds and an additional 11 provisional breeds. Many kennel clubs worldwide use the listings of the FCI as their classification system. How Does Breed Classification Work? 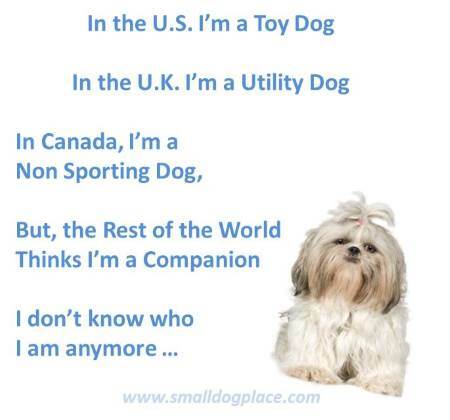 Classifying small dogs is another story, and complicated one at that. No one really agrees where to put these little dogs. Take the Shih Tzu, for example, in the U.S., the Shih Tzu would be considered a toy breed by the AKC. In Canada, they are grouped with non-sporting dogs. In Great Britain, they are considered to be in the Utility group and the UKC places them in their companion dog grouping. Trying to figure out how a dog is defined in the world of dogs gets very complicated. Breeds are called different names depending on where you are located in the world. Some are registered by their English name and others go by the name given to them by the country of their origin. For example, in the United States, we know the lovable, energetic pooch, the Brussels Griffon (pronounced griff-ON). Elsewhere, you might hear them referred to as Belgian Griffon, Petit Brabancon, or Griffon Bruxellois. I have tried to list all the breeds of small dogs known throughout the world. Did I miss any? If you know a breed that should be on this list, won't you take a moment to let me know. Contact Me Now. If you would like an alphabetized list with pictures of all small dogs, click here. 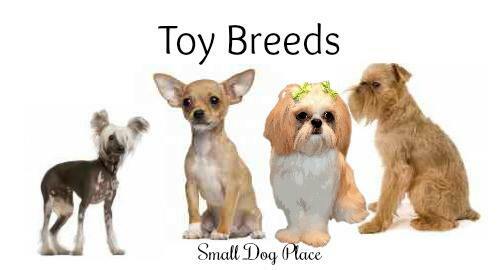 Many of the small dogs belong to the Toy Group. All kennel clubs recognize toys but the UKC which calls this group Companions. Not all breeds of small dogs are toys, but the majority fall into this grouping. Some may be fragile and delicate but there are just as many who are hardy and energetic. Many make great companions for people living in apartments or small spaces. For first time dog owners, these are the best because they are easy to control, don't eat very much, and clean-up is much easier with a 4 pound dog that with a 104 pound giant. Best of all, they are generally very adaptable, meaning that they will adjust themselves to your life-style. Did I mention they were easy to travel with and transport by car or plane? The Terrier Group: A list of all small size terrier dogs. Feisty and determined, members of this group exudes with energy. They are a diverse group with some being too big to list on this site. 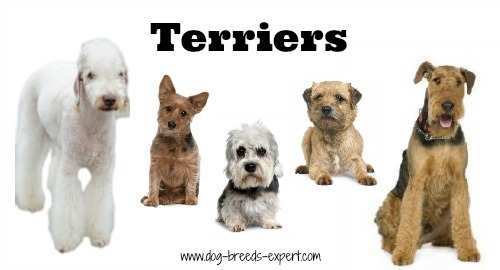 All terriers were once developed to help rid the world of vermin and many characteristics that made them great raters of centuries gone-by still exist today. They may still take off at the sight of a squirrel, but most are no longer used for their original purpose. Rather they enjoy the comforts of our homes and make great companions to people who are energetic and want a dog capable of enjoying the active lifestyle. 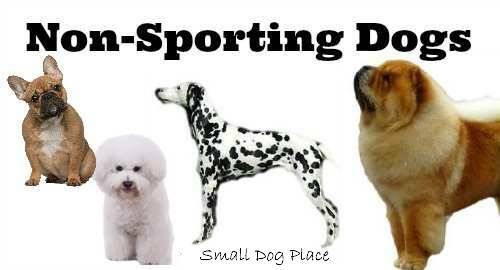 The Non-Sporting Group: All of the small breed dogs that belong to this group. I call this non-sporting group the catch-all. It is truly the most diverse group of dogs and as far as I can determine the reason they are in this group is because they don't fit in any other group. You be the Judge! 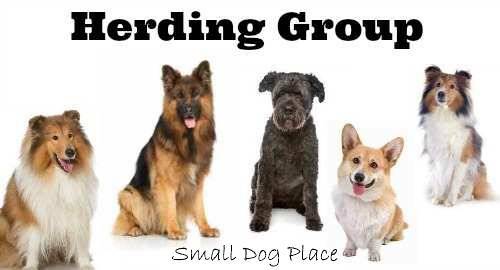 The AKC Herding Group: All small breeds that fall into this category. 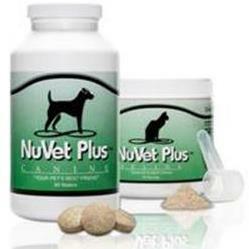 The American Kennel Club places dogs in this group because of their ability to work livestock. Most of the dogs in this grouping are larger and are not part of the list on Small Dog Place. There are some that are small enough to be placed here. Other kennel clubs such as the Australian National Kennel Club group these dogs into their Working Dogs Category. The Kennel Club in England calls the group, Pastoral. For the most part, these dogs are family companions who have retired from their former work role. However, it is not uncommon for their herding instinct to resurface. 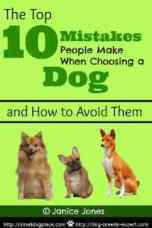 Many owners report that their dogs enjoy herding them, and especially their children. 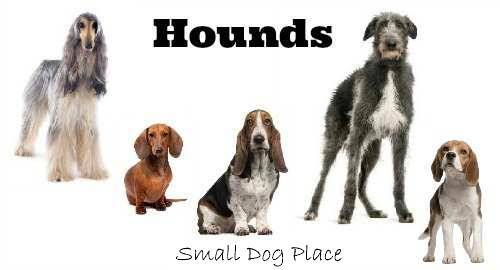 The AKC Hounds Group: List of small dogs that belong to this grouping. All the dogs in the Hounds Grouping were used for hunting at one point in history. Most dogs that fall into this grouping are large and would not qualify to be added to this breeds of small dogs' page. Some had an exceptionally good sense of smell and could tract and follow a scent. Others were very fast and were used for chasing prey. Still others, the sight hounds were bred to hunt larger animals, first locating them visually and then chasing them down. The one thing that most hounds all have in common is they need exercise, some more than others. Most do not do well off leash. Training can be time consuming, but on the bright side, these dogs are a breeze to groom. The United Kennel Club groups breeds that were developed in the north and include the Spitz varieties. Most are not breeds of small dogs, however, the Alaskan Klee Kai is one exception.